The dictator may have proved that he has nine lives; that he knows how to 'die' in the rumors of 2003 only to live. Biya knows that his regime has no stake in the promise of Resurrection Sunday. There is a lot of anger out there these days. A fraction of it has been on display over the last month on Wall Street. Last weekend, it boiled over, spreading to 80 countries in four continents. Cameroon was silent, but do not let that silence fool you. Cameroon was silent until the angry protests of the 1990s. It was silent until the explosion of anger in February 2008 to protest high food prices. To be clear, Cameroonians’ anger cannot be contained. Want proof? Look at the absenteeism rate during the October 9 ballot. 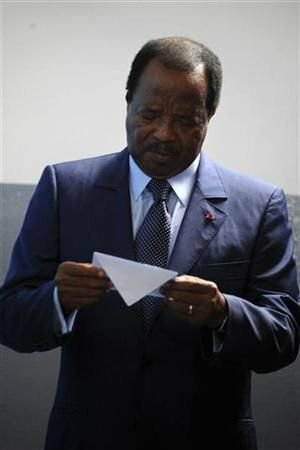 Consider the anger of officials of the ruling party who, even in Biya's native South Region, could not convince those they consider die-hard supporters of the 78-year president to perform their civic duty. The anger is visible in hard-hitting Internet exchanges among Cameroonians. The opposition leaders who met last weekend in Ni John Fru Ndi's residence in Yaounde must be hoping that an angry Cameroon is waiting for an avenue to vent, whence the Yaounde Declaration. Even if its signatories have misread Cameroonians; even if they fail to galvanize street protests; they hope a “never-was-in-doubt” Biya "victory" would trigger nationwide rage. The Yaounde Declaration shows that the opposition understands one thing: democracy will not come to Cameroon from Biya or the man Higher Education Minister, Jacques Fame Ndongo, considers no less than a "god". The opposition's new-found anger comes after its members have hit the snooze button too many times in the recent past. They were not angry enough to call for demonstrations when voter registration went sour. They had no anger to spare when it was time to commemorate the February 2008 massacre of Cameroonians. A lonely Kah Walla had to fight riot police in Douala's Rond Point alone. If your friends are in the opposition, as mine are, you have to swallow your own anger in stating that we cannot let the perfect be the enemy of the good. It is a good – not perfect – thing to see the opposition trying desperately to reawaken what I call the “Anger” or the "Spirit of the 1990s". Democracy is begotten by anger not delivered by the monarch. Our people need to rediscover the anger of civil disobedience; of taxi and student strikes; of the good, old-time political religion of "villes mortes", etc. It is this kind of anger, not royal magnanimity, which forced Biya in 1990 to throw in the towel of one party state. Rigged elections sanctioned by a fraud-blind Supreme Court do not enthrone democracy. History is a stubborn thing, especially because it is written in indelible stone. It bears being remembered at this moment. The opposition has been down this road before. In 1992, remember? Unlike today, the opposition of 1992 did better than await the Supreme Court results or appeal for a cancellation of the ballot - even if they did that, too. The opposition declared and crowned Fru Ndi the winner of the ballot. An election victory press conference held, a cabinet was expected but angry Cameroonians were told to keep a lid on their rage until the Supreme Court declared the results. When the results were released, the North West Region went up in flames of anger, largely wasted because the Biya regime had turned the anger game on its head, directing it for its own evil purpose. The regime then capitalized on that anger to declare a state of emergency; to arrest and torture opposition leaders; to justify the house arrest of the opposition leader "for his own protection" from angry mobs, as the then government spokesperson was not ashamed to repeat ad nausea. Biya knows something we feign ignorance of at our own peril. From 20 years of outwitting the opposition, Biya can trust the opposition to do the wrong thing and play right into his hand. He expects 2011 to be a walk in “undemocratic park” compared to 1992. He trusts the opposition to fail to mobilize enough angry citizens and to keep them in the streets long enough to revolt the civilized world and turn opinion around the globe against Fame Ndongo’s "tin god". As elsewhere across the globe, the time has come for the 99 percent of Cameroonians, misruled these past 29 years by Biya’s "tribu de la mangeoire", to direct some of their anger to taking out the monsters in power in Cameroon. Not just at each other. The “opposition eats opposition” game of the last few years, which played out in the numerous presidential candidates, helps Biya. Cameroonians need a different kind of anger. They need the anger of the "Occupy Wall Street Movement" in the USA - which last week went global. That anger shows that it is will be no easy task – in the USA and in Cameroon – for even the majority 99 percent to dethrone the democracy of the one percent, for the one percent, by the one percent that Biya leads. Yes, democracy will come to Cameroon, but not just because another declaration was made. It will take the raw anger of Cameroonians, appropriately channeled and sustained, to oust Biya. The dictator may have proved that he has nine lives; that he knows how to “die” in the rumors of 2003 only to live. Biya knows that his regime has no stake in the promise of Resurrection Sunday.